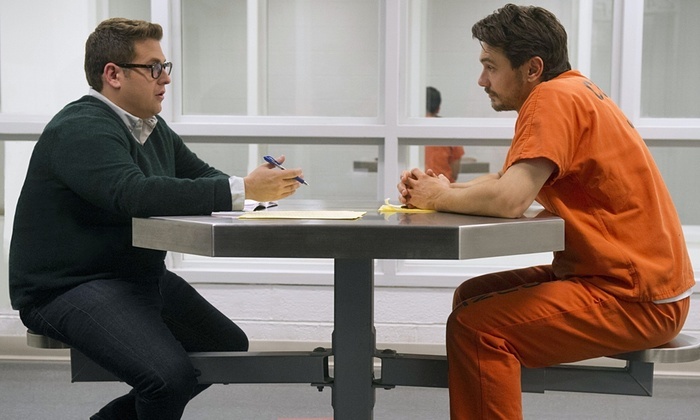 TRUE STORY is essentially a two-hander between often-time comedic collaborators James Franco and Jonah Hill. In this film, they try their hand at a straight psychological drama with limited effect. Hill plays real-life New York Times journalist Michael Finkel who was sacked in the early 1990s for falsifying sources on a story. Per Finkel/Hill he was doing so to enhance an important ethical story for the greater good. The result is that Finkel is washed up until a murderer on the lam decides to appropriate his identity in order, in turns out, to lure him into a relationship. And this forms the body of the film. We see James Franco play Christian Longo, accused of killing his family, give up pieces of that story to Finkel in exchange for advice on how to better write his testimony. Prisoner/journalist stories of this kind have the capacity to be quite spectacular, and at their apex - Capote and In Cold Blood - have the ability to ask frightening questions about how far each side needs the other and is complicit in the other's crimes. How far does Finkel let Longo manipulate him because he needs the story that resurrects his career? This sort of material requires great skill on the part of both actors - we need to see and feel layers of motivation and ambiguity. I'm afraid that I just didn't get that from either actor here. Moreover, and this must be more down to the screenwriter and first-time feature director Rupert Goold - the pacing felt sluggish and the movie overall lacking in tension. So overall, there's very little here to attract an audience either on the big screen or on DVD. TRUE STORY has a running time of 99 minutes and is rated R. It played Sundance 2015 and was released earlier this year in the USA, Canada, Brazil, Spain, the UK, Ireland, Germany and France. It is now available to rent and own.